American pork producers face giant financial damages, as China has banned the importation of meat produced with the use of a popular growth hormone which is widespread in the US. Europe will deliver more pork to China this year than the US despite the latter being considered a world leader in the export of pig products, Robobank reported. The reason is simple — Beijing has banned a growth-inducing hormone which is fed to 80 percent of hogs in the US, according to Bloomberg. The drug, called Ractopamine, promotes quick weight gain in animals which are raised for their meat, and according to the agricultural regulators of most countries throughout the world, poses a threat to human health as well. Imports of American pork to China have decreased by 41 percent year over year in the first six months of 2015, the worst results since 2010. Foreign sales of US pork have fallen in the US for four years in a row, according to official statistics. At the same time, US pork production has beaten a national record this year, topping 24.6 billion pounds. China's market is very attractive to US farmers. According to The Economist, since the 1970’s, pork consumption has grown with the Chinese economy, increasing nearly sevenfold. China now produces and consumes almost 500 million pigs per year, half of all the pigs in the world. 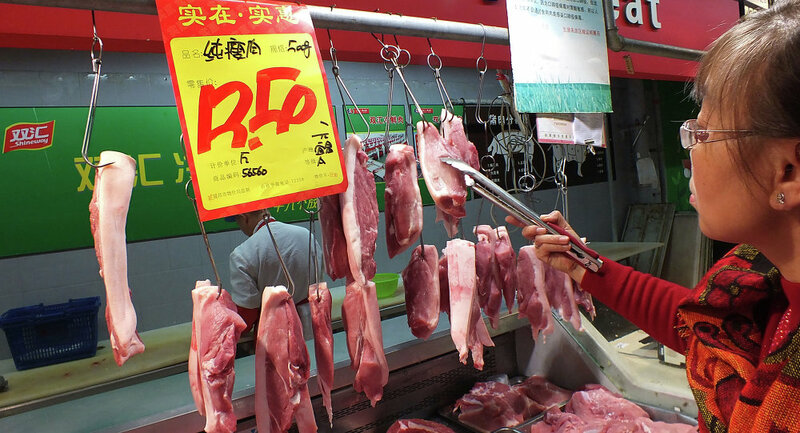 Moreover, Chinese buyers purchase not only pure meat, but also ears and organs of hogs, parts that traditionally have little demand in other countries. Eventually, it raises the cost of each US-raised animal by $10 dollars, Bloomberg added. However the ban of Ractopamine has made most American hogs undesirable in China. In an attempt to meet agricultural standards that have been adopted by China and throughout the globe, American farmers are rushing to switch to Ractopamine-free meat production. However, even if they manage to do so in a short period of time, they could easily lose out to European farmers, Bloomberg noted. Meanwhile, Chinese domestic production isn’t enough to slake the Celestial Kingdom’s demand for pork: USDA predicts that imports will total 800,000 metric tons in 2015, breaking all records. The sale of meat produced using Ractopamine is prohibited in 160 countries, including the nations of the EU as well as China and Russia.